If you and your dog are ever in St. Louis, this is one place you definitely should check out: the Museum of the Dog! Yes dogs are allowed and it is an actual museum of art with a wide range of mediums, artists and historical periods. If you can’t make it to St. Louis, you can watch this fun “Snouts in Your Town” video on Petcentric which gives you glimpses of the paintings, sculptures, and even silverware collars on display. They even have wings dedicated to dogs in the military and police! The video has an interview with the museum’s Executive Director, who reveals it is the only dog museum of its kind in the world, the origins of dog art. It’s rather amazing how much information is included in this video, even though it is only 3 minutes long. 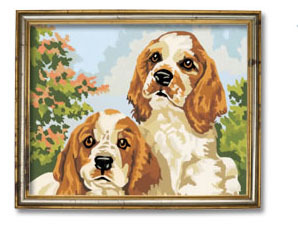 We here at Adopt-a-Pet.com have a quite a number artist portraits of our own pets on our walls, and seeing all this dog art was a lot of fun! Do you have pet art on your walls? Let us know by posting a comment on our Facebook wall.